Recent advances in science have clarified the biosynthesis pathway and functional role of secondary metabolites. They play a major role not only for completion of the plant life cycle but also for communication with other organisms. In Brassicaceae, including radish, the most well-characterized secondary metabolite is glucosinolate. Glucosinolates are sulfur-containing metabolite and their associated degradation products have distinctive benefits for human diet and defense against pests. Plants produce approximately 200 types of different glucosinolates and those from different species show great diversity, with their contents being affected by the environment, cultivation conditions, and genetic background. The profile of glucosinolates in radish is attractive, but its biosynthesis pathway remains unclear. Here, we highlight recent progress in glucosinolate research of model plant Arabidopsis thaliana . 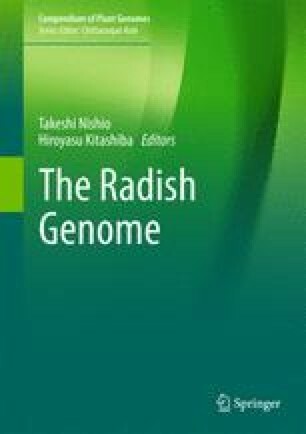 To compare researches on glucosinolate between radish and A. thaliana, we further discuss with specificity the nature of glucosinolate in radish.